I’m fascinated by culture-observers (for the most part). Some culture-observers irritate me, however, because they seem to focus only on outward circumstances, the surfacy points of reference – the latest fashion, phone, trend of this, that or the other. I was captivated some time ago by a culture-observer named Paul. You may know him better as the Apostle Paul. Yeah, the guy in the Bible who “went toward the light” and got knocked on his kiester (and that was a good thing!). During his journeys he was dropped off for a short season in Athens, Greece. Been there lately? Beautiful city not far from the Mediterranean, favorite tourist haunt, birthplace of the Olympics. You know the place. Paul was greatly distressed in his spirit as he did a walkabout. It was recorded that he “observed” Athens with all of its idols, shrines and even a statue to An Unknown God. This word “observe” could also be translated – examine, look closely, study. Paul quickly became a student of the Athenian culture and all of its trappings, subtleties and nuances. His heart became broken for them. Next thing he knew, he found himself at the Areopagus. What in the world is an Areopagus? Sounds like an extinct dinosaur. Nope. Let’s let the Bible describe what it was – “Now all the Athenians and strangers visiting there used to spend their time in nothing other than telling or hearing something new” (Acts 17:21). Humph? Sound familiar? Paul used his observations as “springboards” of discussion and tied together many God-thoughts and insights, delivering them to the culture influencers. He wanted to be a messenger of hope. Notice that some believed, some mocked and some said they wanted to talk further. Places of cultural influence. That is how I’d describe many of our local Starbuck’s, Seattle’s Best or Caribou or whatever your local expression of a coffee shop would be. Next time you’re at your local coffee shop, look closely and observe the types of conversation and communication taking place. My point? 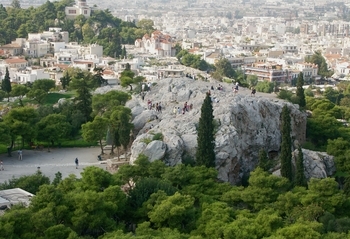 These meeting places, similar to the Areopagus, have become some of our key points of influence in culture today. Application to your situation in life? Take time to slow down and observe your surroundings. Take time to see the people and their hearts, not just a sea of faces. Allow God to move your heart in the way His heart is moved for our world! Be intentional about intersecting at key points in your culture. Ask God to give you some “springboard” ideas with which to initiate a discussion that could lead to spiritual things. The culture needs to know and see the “grounds” of our faith!